Harmer Roof & Balcony Outlets: Aluminium AV400 range of flat roof outlets &Two-way parapet outlets, Cast Iron Roof Outlets and Modulock Raised Paving Support Pedestals are innovative and hard-wearing roof drainage products, designed to perform and engineered to last by the UK’s market leading, specified brand. ZincEdge is a simple to fit roof edge capping solution for a clean, professional finish to small structures such as garden rooms or extensions. 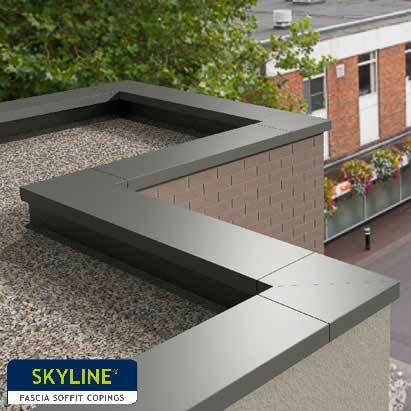 Skyline Aluminium Coping is manufactured from high quality, polyester coated aluminium for economical and easy installation. This range of roof drainage solutions from Harmer combines innovative engineering and high performance materials. The Modulock Raised Paving and Decking Support system from Harmer. Designed for use in terraces and flat roofs to conceal electricity, gas or drainage and support slabs or decking at varying heights. Finishing a flat roof edge can be tricky yet critical to the performance of a flat roof. Solutions are often difficult to fix and don’t always give the protection needed. Zincedge is an innovative & effective roof edging system.